XpertMart™ gives you the flexibility to create and use multiple price lists. Having multiple price lists are essential if you combine different types of selling, for example, selling wholesale as well as retail. Multiple price lists are also very useful if you have a large chain of stores and need to differentiate pricing by geographic region or by store type. Your stores in West Virginia may have a very different price level than your stores in New York City. Similarly, your stores in strip malls may need a different price point than your downtown stores. IMPORTANT NOTE: Every additional price list you create slows done the Synchronization process and the Update Prices routine. Therefore, do not create unnecessary price lists or you will needlessly slow down XpertMart™. To create multiple price lists, follow the same procedure you did to create your first price list. Every time you create a new price list, you are adding an additional entry in the Prices Catalog for every existing item. For example, if you have 600 items in your Items Catalog and you create 3 price lists, there will be 1800 (600 x 3 = 1800) records in the Prices Catalog. Notice in the Prices Catalog there is a "Price List" field that indicates the price list that the particular price you are looking at belongs to. 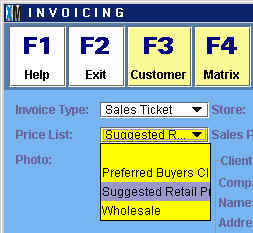 The field appears grayed out and is not editable as it is written-in automatically by XpertMart™. However, you can run a Query by Example to only see the prices belonging to one price list. When you click on the Clear Form button the "Price List" field will become active and you will see all of the price lists in a drop-down menu you can use to choose one and run the Query. If you need to make large-scale changes to a price list, use the Mass Changes to Prices and Costs tool. Remeber, any time you modify prices you need to run the Update Prices routine. Each store in your Stores Catalog can be assigned to a specific price list. You may need, for example, to offer lower prices at a store that is next to a competitor offering steep discounts. When you assign a store to a price list it will by default "pull" it's prices from that particular price list. To assign a store to a price list, enter the Stores Catalog and select the appropriate price list from the "Price List" drop-down menu. If you are not using any price list, then you will want to select the "Use List Price" checkbox. (If you choose to use the List Price, XpertMart™ treats it as if you were using list price "0" just like "Suggested Retail Price" might be list price 1 in your Price List Catalog). You can also use different price lists for your customers. For example, you could create a special price list for your VIP customers or for your wholesale cusotmers. To assign a customer to a special price list, open the Client Catalog and select the appropriate price list from the "Price List" drop-down menu. If you leave this field blank then the customer by default is using the price list previously defined for the Store she is shopping at. You can switch price lists at the Point of Sale, even entering items into a transaction with different price lists. When you first open a transaction screen, XpertMart™ will automatically enter the default price list into the "Price Lists" field. Usually this is the price list you have previously assigned to the store where the transaction is being done. However, when you enter a customer into the customer field of a transaction such as an Invoice, XpertMart™ will automatically switch to the right price list. You can switch price lists midway through a transaction. When you enter a new item into the transaction, XpertMart™ pulls prices from the active price list, i.e. the last price list you selected. (If you are invoicing to a customer with a special price list it is very important that you enter the customer into the customer field before adding items to the Invoice to make sure the correct price list is used for all items). To be able to switch prices midway through a transaction the logged in user must have permission to edit the transaction as shown below. (For more information see the Security topic). 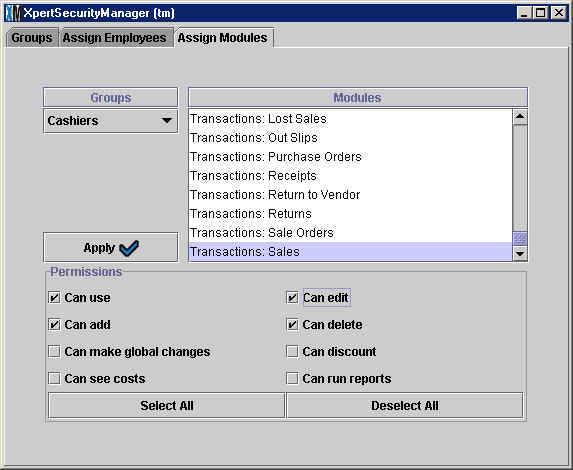 If the logged-in user does not have have permission to edit the transaction but the configuration has been setup to allow managers to authorize discounts, then an Authorization screen will appear just as it does when the user tries to enter a discount into a transaction. (This is because switching price lists can in some case mean the customer is effectively getting a discount). Whenever you make an Invoice, XpertMart™ stores for every item in that Invoice the price list that was used to compute the price. Though this information does not appear on-screen, it is stored in the database and can be exploited through reports.